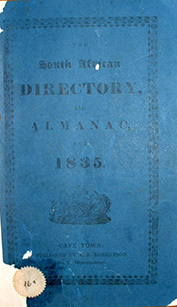 Published just after the official abolition of slavery at the Cape of Good Hope on 1 December 1834, this Directory & Almanac lists a wealth of names, occupations and addresses of the residents of Cape Town and environs, including Green Point. It also lists a number of freed slaves and their occupations. There is a comprehensive list of Military Officers (their ranks and dates of commission) as well as Military and Civil pensioners and how much they received in pension. This Directory has a very special section called “Chronology of Remarkable Events” which begins in 1492 with Bartholomeus Diaz discovering the Cape and goes on to document noteworthy events that affected the lives of the residents at the Cape until 1834. In 1809 for example there was “an attempt to light the Heerengracht” and on December 4th of the same year there was “an earthquake in Cape Town.” In May 1830 Table Mountain was ravaged by fire and in June of the same year “two enormous masses of rock” fell from the mountain. This work will give the researcher a valuable insight into the social history of the Cape in 1835.